If you’re a stressed-out parent looking to make better food at home or a single looking to hone your kitchen skills, home meal kit delivery can have you putting together delicious and unique home-cooked meals in no time. These meals are healthy, tasty, easy to make, and maybe best of all, you don’t have to wait for inspiration to strike and then battle the crowds at the grocery store. With home meal kits, you just go online and browse the latest recipe ideas, and they come straight to your door ready for you to put together. When looking for a meal delivery service, there are a few things to consider beyond just the price per meal. Let's take a look. One of the most important things about choosing the right meal kit is simplicity. Most of these companies are designed for people who didn’t go to culinary school and probably don’t know the difference between a casserole and a cocotte. 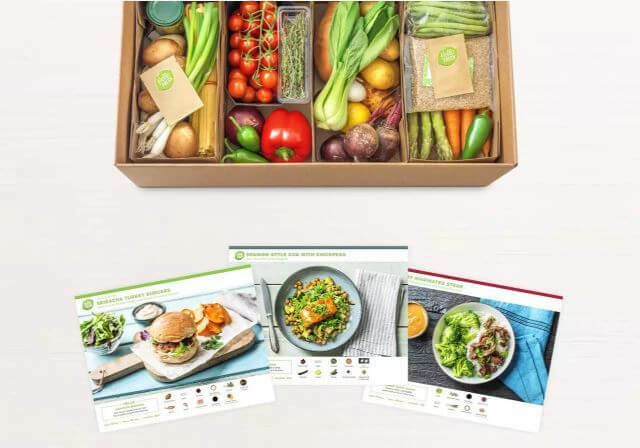 One of the best examples of this is HelloFresh, a company that has made its name with healthy, premium ingredients, but also takes simplicity to a new level. When you order with HelloFresh, the recipes come with all ingredients pre-measured and all recipes take only 6 steps or less, with a preparation time of around 30 minutes. Home Chef features recipes that are basically foolproof, with step-to-step guides that even show you how to slice vegetables and when to add seasonings. One of the most enjoyable things about joining a meal kit service is that you always have new things to try. You never have to think of new recipes on your own, and you can say farewell to the monotonous, repetitive meals of the past. One of the best companies for variety is Plated, which allows you to pick from 20 different recipes each week, as well as 2 desserts. On HomeChef, you can also toss in a smoothie or a fruit basket if you want to mix it up a bit. In addition to the number of recipes, you may also be interested in a service that can accommodate specialty diets. On Sun Basket, you can easily find gluten-free, paleo, and vegetarian options, and when searching, you can filter the results to make it easier. Some companies do a better job than others when it comes to offering vegetarian, Paleo, and other specialty menu items. If you have particular dietary needs, make sure that you order a company that can tailor your menu orders to your needs. With a meal kit plan, it’s important that the company allows flexibility for customers. In other words, if you want to skip a week or you’re taking a vacation and you’d like to suspend your account, you’ll need a company that can accommodate this. Another comfortable feature of many meal kit companies is that they allow you to be flexible with the contents of your order. There may be an ingredient or two here or there that you don’t like, or possibly even you're allergic to. For the most part, meal kits hover in a price range of about $6.99 - $10.99 per serving. The price tends to drop somewhat when you order more. Most companies sell their recipes in meal plans either for 2 or 4 servings, so they’re best for a couple or family of 4. One of the biggest expenses of meal kits is shipping. With some companies, shipping can cost $7.99 or more per serving, while other companies include free shipping on any order over a certain amount. If your budget is tight, try to find one that includes shipping. Great food doesn’t need to be a hassle. HelloFresh gets this, and that’s why each of their recipes only take 6 steps or less and will have you sitting down to dig in within 30 minutes. Now, there are only 8 menu items to choose from per week, but the ingredients are responsibly sourced and highly customizable. The menus feature a wide variety of meat, fish, poultry, pasta, produce and grains, so you should be able to find something that works for your palate. And while there isn’t currently a dessert option, that company is one of the few that offers breakfast in addition to dinner, so you can start your day off right. Sun Basket combines variety and high-quality ingredients to create one of the best meal kit delivery options on the market. The company’s mission is based around 3 core values - clean eating, flavorful meals, and sustainability. Over 99% of the produce the company supplies is organic, and Sun Basket always uses organic dairy and eggs, antibiotic and hormone free meat and poultry, and puts a real focus on using sustainable providers. How’s that translate to your dinner table? With Sun Basket you can find options for paleo, gluten-free, and vegetarian diets, and recipes ranging from mu shu pork to Vietnamese salad bowls. You can also pick and choose “lean and clean” healthy eating options. The recipes are easy to make, and with organic, premium ingredients, you’ll be asking for seconds. Home Chef has put a personalized touch on the meal kit industry, letting customers build a “taste profile” which helps the company determine which meals will be the best match for them. The meals are easy and straightforward, and you can find options for all type of dietary needs, including vegetarian, nut-free, soy-free, gluten-free, and dairy-free meals. There are only about a dozen meals to choose from per week, though the recipes are interesting and easy enough to be all but foolproof. The company works hard to source ingredients locally and use only top-shelf providers. True, Plated has easy to follow recipes and is very flexible with customers, but it's the food that is simply divine. The recipes are crafted by the company’s culinary team and use high quality ingredients that are free of hormones and antibiotics. And while the recipes can be exotic and seductive, you can also just whip up some more standard fare like waldorf chicken salad and spicy crunchy shrimp bowls. You can also add dessert if you really feel like getting carried away. Plated is also flexible - the company will allow you skip weeks, switch recipes and cancel anytime. One drawback though - the company doesn’t offer specifically vegan options. Not everybody can be a celebrity chef or launch their own lifestyle brand, but with Martha and Marley Spoon, you can get some help from one of the best. As part of this mission, this meal delivery service features the award-winning recipes and kitchen technique of Martha Stewart and 10 delectable meal options per week, ranging from Seared Steak and Crispy Potatoes to Thai Shrimp Lettuce Wrap Bowls and Salsa Verde Veggie Enchiladas. There are always at least a few veggie options each week. Martha and Marley Spoon gives you great home dining options. You’ll enjoy delicious dinners and also learn how to bring a little bit of that Martha Stewart magic into your home kitchen. Don’t let the lines outside that new hot restaurant downtown fool you - what we truly love is home-cooking. Meal Kit companies realize this and are helping customers find more and more ways to eat better, easier, while also learning some new kitchen skills. Try out a couple of these top meal kit companies and let your taste buds do the talking.